New data from analytics firm Sensor Tower reveals that Pokémon GO tops $160M in global revenue. The time spent in-app still remains high with an average around 26 minutes per day in the U.S., says Tech Crunch. 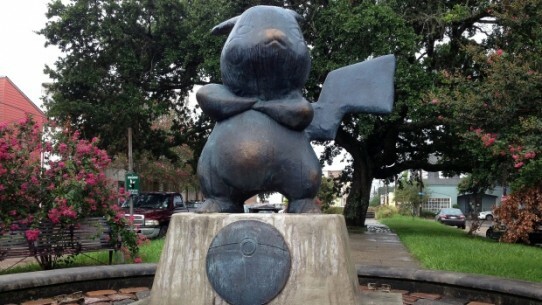 Over the weekend someone put up a statue of none other than Pikachu at the center of a broken fountain in New Orleans, Associated Press reports. The Pikachu statue has his arms crossed with a Pokeball down the center. Additionally the hashtag “#POKEMONUMENT” was inscribed on the cement. Developer Riot Games will be debuting the first episode of a four-part League of Legends documentary series on YouTube Friday, noon PT. The miniseries Live|Play highlights 12 unique stories surrounding the LoL community: from pro-players, cosplayers, photographers, and more. The episodes are expected to be released every two weeks, says Mashable. Overwatch dominates the PC game charts, reaching over 15 million players fast and 500 million hours played. Players have spent $900 million on content and virtual items this quarter, reported the Los Angeles Times. With Overwatch’s successes, Activision Blizzard said it expects $1.49 billion in revenue in the current quarter. GamesIndustry.biz says that DFC Intelligence has released a new report on the global PC gaming market, forecasting game software revenues to climb to $42 billion by 2020. The previous record high was $30 billion in 2015, which included a combination of retail sales, subscriptions, virtual items, advertising, and digital distribution revenue. Some key PC gaming trends highlighted by DFC include distribution services (like Steam) helping indie developers grow, media attention from VR which drove spending on PC game hardware, and the increasing number of games that cross multiple platforms. The ninth annual GamesBeat conference concluded on Tuesday. There was a vast amount of unique talks from the event including PlayStation VR, Google Daydream, and EA Games. All talks at the main stage were recorded and compiled by VentureBeat here.